THE public are wrong to believe that the Ulster Unionist Party is the least influential party in the Stormont Executive, the party’s minister has said. Responding to the findings of a poll which found that members of the public rated the UUP as having less influence than the DUP, Sinn Fein, the SDLP or the Alliance Party, Danny Kennedy said that was “not the reality”. Mr Kennedy, who since last year’s election has been the sole UUP representative at the Executive table, took issue with the poll – revealed in yesterday’s News Letter – which was conducted last year by Market Research Northern Ireland for Queen’s University. The £15,000 survey was carried out between last May and June and asked people about the 2007-2011 Executive, but has only now been made public by academics. 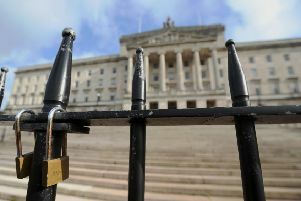 Of a representative sample of 1,200 polled last May and June, more than 28 per cent of people said that the UUP had “not much influence” on the last Executive, with 6.7 per cent saying that the party had “no influence at all”. Mr Kennedy said: “I take issue with this assertion. In my opinion this simply does not reflect the reality of the situation and I know from personal experience that the Ulster Unionist Party has played a crucial role in shaping and delivering on the work of the Executive. “The Ulster Unionist Party successfully lobbied the Prime Minister for a resolution of the difficulties faced by savers with the Presbyterian Mutual Society, we delivered free prescriptions, we removed the Sinn Fein threat of car parking charges for rural towns throughout Northern Ireland, we delivered the new South West Hospital in Enniskillen and the development of the new enhanced hospital in Omagh, the redevelopment of the Ulster and Altnagelvin Hospitals and a new emergency and trauma centre at the Royal Victoria Hospital. The survey also found that 31.8 per cent of people believe that the health service got “a lot worse” between 2007 and 2011, with 23.7 per cent believing that it had got a little worse. Just 2.3 per cent believed that the health service had got a lot better during the period when the UUP controlled the health department. But Mr Kennedy claimed the public were wrong about that as well. “My party colleague Michael McGimpsey was referred to by name in the piece. “As Health Minister between 2007 and 2011 he most definitely had significant influence. He said Mr McGimpsey “also oversaw record investment in health and social care over a four-year period”. The Regional Development Minister, who has forged close links with DUP ministers and attends DUP ministerial meetings, said that since he entered the current Executive he had delivered on free car parking and had ensured that the upgrade of the Coleraine to Londonderry railway line would go ahead. Mr Kennedy also pointed to the announcement of more than £500m for investment in the A8, A5 and A2 road schemes as “one of the most important announcements that the Executive has ever made”.